Four finalists presented designs to commemorate victims of MAX attack at Hollywood Transit Center on Wednesday. 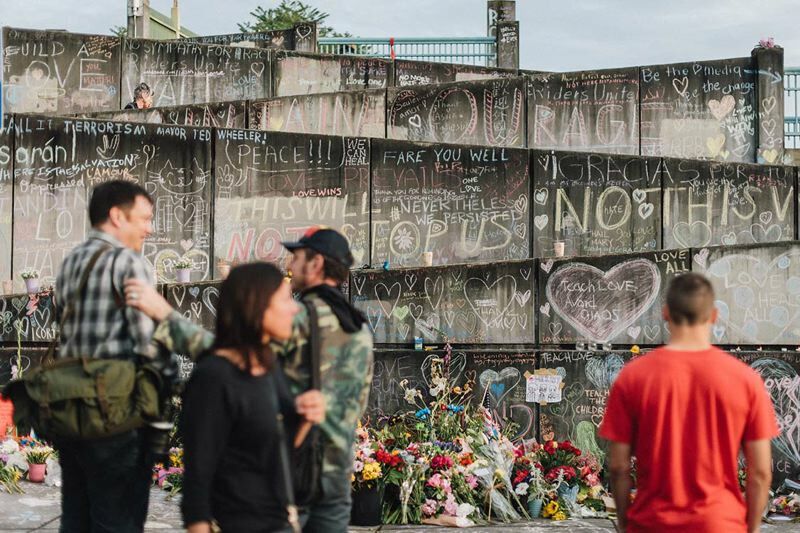 TriMet expects to choose the design and artist for the planned Tribute Wall at the Hollywood Transit Center on Thursday. The project will honor those who lost their lives in the May 26, 2017 attack on a MAX train, as well as recognize the courage of those who were targeted by and stood up to hatred and violence, TriMet says. Before the decision is made, the four finalists presented their concepts to the Hollywood Transit Center Tribute Advisory Committee on Wednesday, Jan. 31. Following the presentations, committee members met privately to discuss the selection of the artist. Mohamed Alyajouri, of the Muslim Educational Trust, is a member of the advisory committee. The group has talked about several common values, he said at the meeting. The most common overarching theme has been community, moving forward — what's the city and the community doing to acknowledge it, but also move forward in a positive direction to say no to hate, Alyajouri said. The presentations began at 3:00 p.m. in the Saltzman Conference Room of the TriMet Administrative Office, located in the Harrison Square Building at 1800 S.W. 1st Ave. The decision will be announced at the Hollywood Transit Center on Thursday, Feb. 1, at a time yet to be determined. TriMet hopes the artisit will be present. TriMet is planning to have the project finished by May 26, 2018, the one-year anniversary of the attack. Jeremy Christian is charged with numerous crimes, including murder, in the attack. It happened after other riders on a MAX train came to the defense of two girls he was verbally assaulting, including one wering a hijab. Christian pulled out a knife and stabbed Rick John Best and Taliesin Myrddin Namkai-Meche to death. He also seriously wounded Micah David-Cole Fletcher. Christian has pleaded not guilty. His trial is set for June 24, 2019. The MAX train stopped at the Hollywood Transit Center after the attack. Over the following days, a spontaneous memorial was created by the public at the station, including tributes to the victims on its walls. TriMet says that after conferring with the families of those involved, the agency decided to put a commemorative plaque at the center. It will be 4 feet by 6 feet, made of porcelain enamel on steel, and include descriptive words that honor the three men and the two women, along with images of the original memorial. Writer, designer, editor and typographer John Laursen was seelcted to design the artwork. For four decades, his Portland studio has specialized in the design and production of books and text-based public art projects, including memorials. He will work directly with the families and others to create it. You can learn more at trimet.org/tribute. Oregon Public Broadcasting is a news partner of the Portland Tribune and contributed to the story.